“The Wall” from Christian Faith Publishing author Ernest Francis Schanilec is a gripping story of personal integrity, ideals, and opposing values, coming together in a violent clashing at the wall dividing America from her Mexican neighbors. The book follows Tom and Samantha Hastings’ struggle with influential figures and renegades fighting for their own patriotic ideals and personal security. 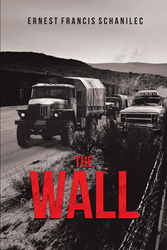 “The Wall”: a complex tale of conflicting moral and political values, the fourteenth book in the Tom Hastings series. “The Wall” is the creation of published author Ernest Francis Schanilec, a retired dentist turned full-time novelist based out of Texas, near the famous wall. Schanilec writes, “ ‘Oh my god, Tom, the army guys have spread out, forming a defensive circle around us. The protesters are trying to get through the army guys but are being pushed back by Army rifles!’ Sammy exclaimed. Samantha raised a fist in the air. ‘Tom, I can’t just stand by and watch all of this without doing something. I’m going to attack!’ she exclaimed. ‘What!’ Tom gasped. ‘You’re crazy.’ He stared in amazement as Sammy charged ahead and approached the line of the Army National Guard. Some of the Guardsmen turned their heads and smiled. Published by Christian Faith Publishing, Ernest Francis Schanilec’s new book is an invigorating close-up look at the violent action surrounding a notorious barrier at the southern border of the nation and all it implies for those fighting on either side. The wall becomes a powerful metaphor not only for the physical barricade but the political, emotional, intellectual, and idealistic separation of man from man. View a synopsis of “The Wall” on YouTube. Consumers can purchase“The Wall” at traditional brick & mortar bookstores, or online at Amazon.com, Apple iTunes store, or Barnes and Noble. For additional information or inquiries about “The Wall”, contact the Christian Faith Publishing media department at 866-554-0919.